What is a Love Auction? 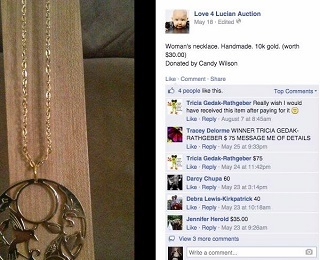 A love auction is an online silent auction done on facebook. Love Auctions are great for adoption fundraisers but can also be used for any fundraiser! How can I do a Love Auction? Doing a love auction is simple. First you need merchandise like give-a-way baskets, soaps, gift cards, jewelry, etc; anything that you would normally find at a silent auction or anything you could sell. Take really nice pictures of each item individually. Post these pictures in a single album on your facebook and name it Love Auction for (Your Fundraiser Name). Have your friends bid on items by leaving a comment under the picture with a price they are willing to pay. 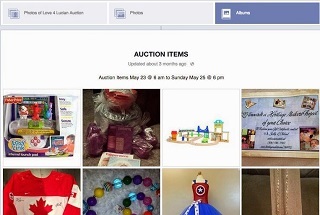 Once your auction has ended, go through each picture and see who has the highest bid. Inform the winner that they have the highest bid and give them the link to your Continue to Give fundraising page or Giving page to donate that amount owed. Once they pay, contact them to see when they would like to pick up their purchased silent auction item or if you need to mail it to them ask for their address. Advertise your intention for a love auction at least two weeks in advance. Send out reminders and get people excited for the products they can bid on! Have a minimum bid for items. For example: if you have a $25 gift card make the minimum at least $15. Explain that the only increments of bidding are in dollars not pennies. For example, have people use dollar units and to not up their bid by $.01.